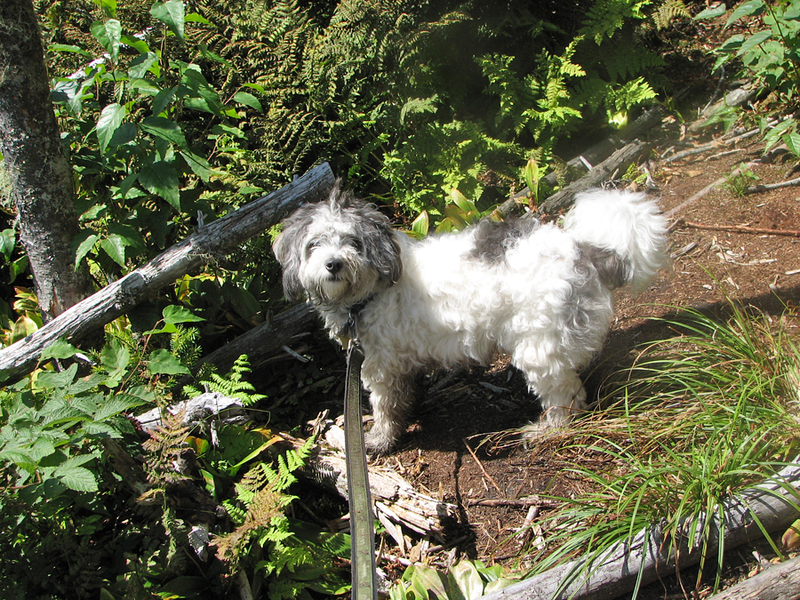 This was Patches' first 4000-footer and her first time up in the White Mountains. Ironically, Mt Waumbek was Muffin's last 4000-footer, way back in February of 2006, eight and-a-half years earlier and two contrasting seasons apart. It was also the first time I climbed Mt Waumbek in the summer. The other two previous trips had both been in the winter, and I was looking forward to see what the trail looked like without snow. By the end of this hike though, I decided that Mt Waumbek was a better winter hike than a summer one. The snow smoothed out all the rough and rocky sections of the trailm and he firs and spruce were much prettier with snowy boughs. 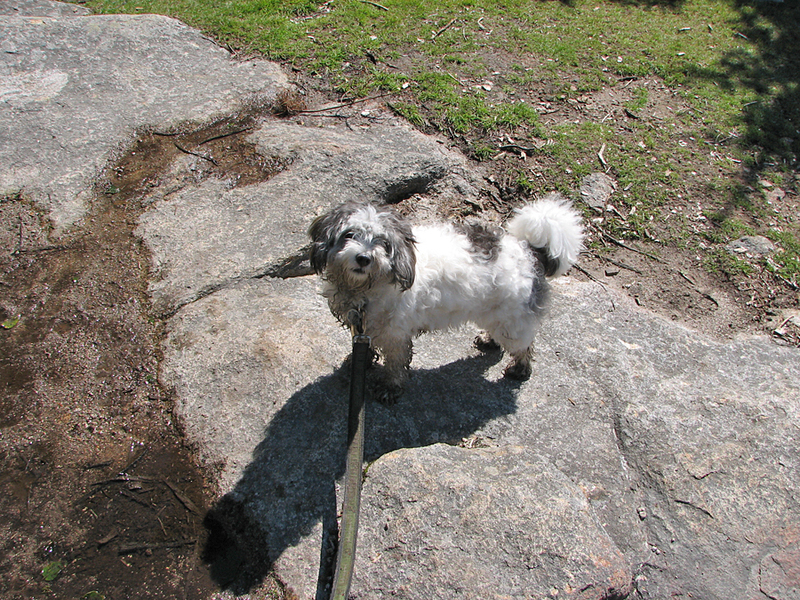 Patches, a cockapoo like Muffin, is a good hiker but she doesn't enjoy car rides the way Muffin did. Muffin couldn't wait to climb into the car and liked to hang her head out the window. Patches spends the entire ride lying down on the seat drooling and sometimes throwing up. We need to bring a couple of throw blankets and a towel or two each time we go for a long ride. By the time we got to the trailhead, she had already thrown up twice, even though she hadn't eaten breakfast. However, she quickly recovered once she was out of the car and on the trail. I should mention that, since this first 4000-footer trip, we got some prescription medicine from the vet that works to calm her nausea. She doesn't throw up when she's taking it, but she still drools like Pavlov's dog, so it's probably a conditioned response..
She does have one little mildly annoying quirk while hiking up a trail. Approximalely every thirty to sixty seconds, she wants to stop, turn around, and stare at the trail behind us to check if anyone is coming. I'm afraid she picked this up on our summer hikes on the Cape Cod Rail Trail, where bicycles frequently came up behind us and we had to keep moving over. "There won't be any bicycles here," I told her, not that it made any difference. After reaching the top of Mt Starr King, which is about a hundred feet short of being a 4000-footer, we spent about a half hour relaxing, snacking, and enjoying the nice weather and views, even if they were rather limited. It was nice to be in the mountains again. 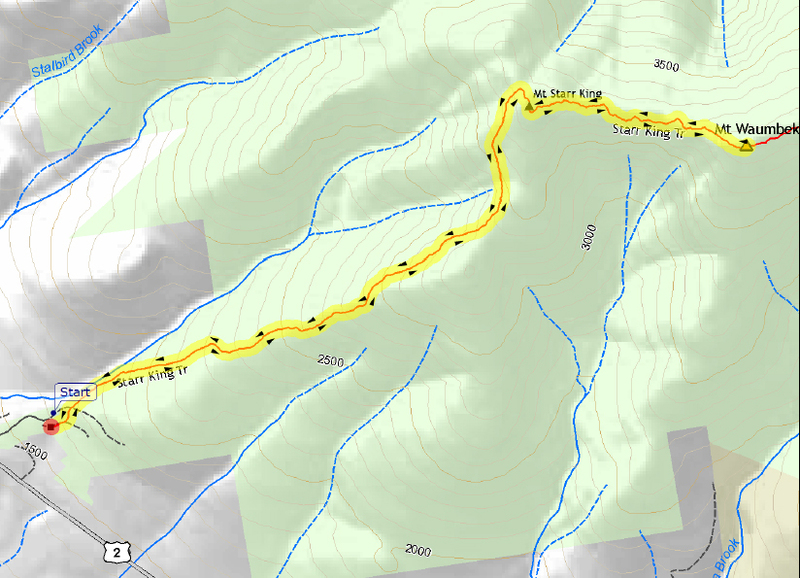 I hadn't been up to the White Mountains since my last trip back in mid-June when I climbed Mts Monroe and Pierce and worked on my adopted trail, the Mt Clinton Trail. It's a good thing I have a digital camera because I took a number of pictures of Patches while were on Starr King, at least four or five for every decent one. She hates to sit still for pictures. She's extremely curious and is always looking around, at least in every direction but the camera. I think I finally got her to look up at me by asking her if she wanted to go out for a walk. At the top of Mt Waumbek, which is mostly a slightly higher point in a long flat area, we stopped again for more pictures, including one in front of the summit cairn. I managed to take a better picture of her over near the viewpoint. At least she was looking at the camera again. 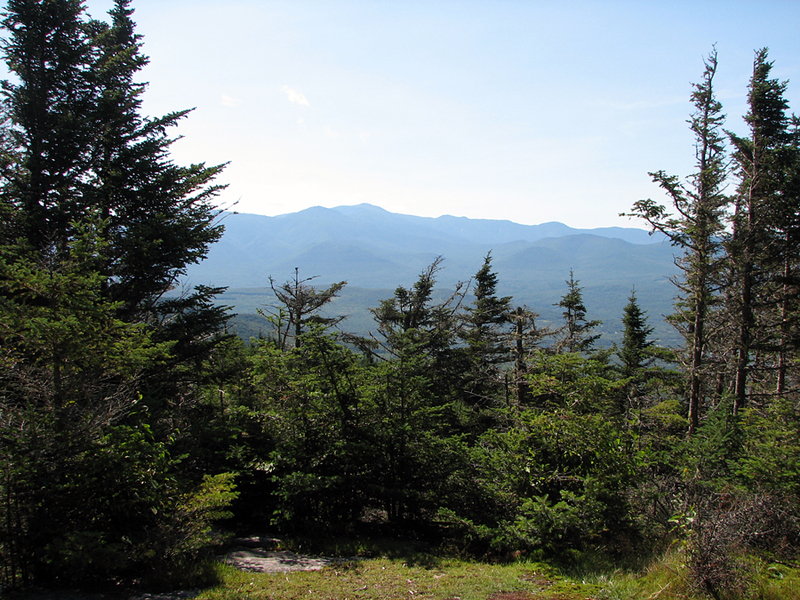 The viewpoint is a short hop along the Kilkenny Ridge Trail from the actual summit, and has good outlooks to the northern Presidentials. On the way back down, we stopped again at Mt Starr King for another short rest and snack, and then made extremely quick time back to the car. Patches can move very quickly downhill, negotiating rocks and roots with ease. Her first 4000-footer trip was over and, needless to say, she was reluctant to get back in the car for the long drooling trip home. Patches on the lower part of the Starr King Trail. 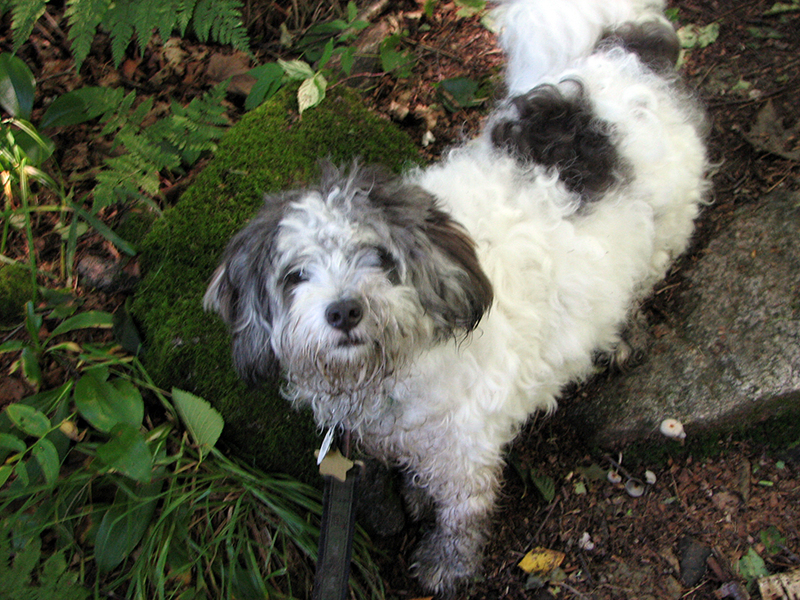 She was pretty scruffy at this point, and would be getting groomed in about a week. 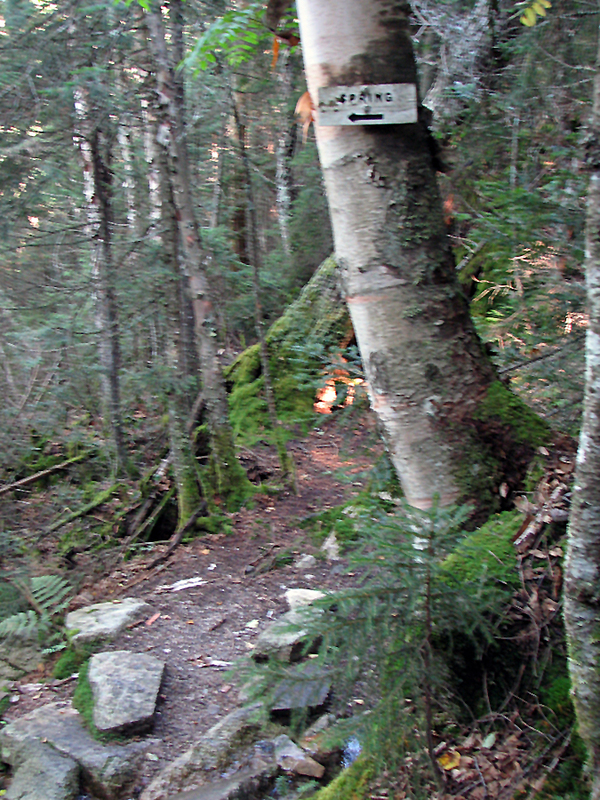 Sign for the spur trail to a spring. For some reason, possibly low light, I was having trouble with the camera that morning; the pictures were not focused very well. 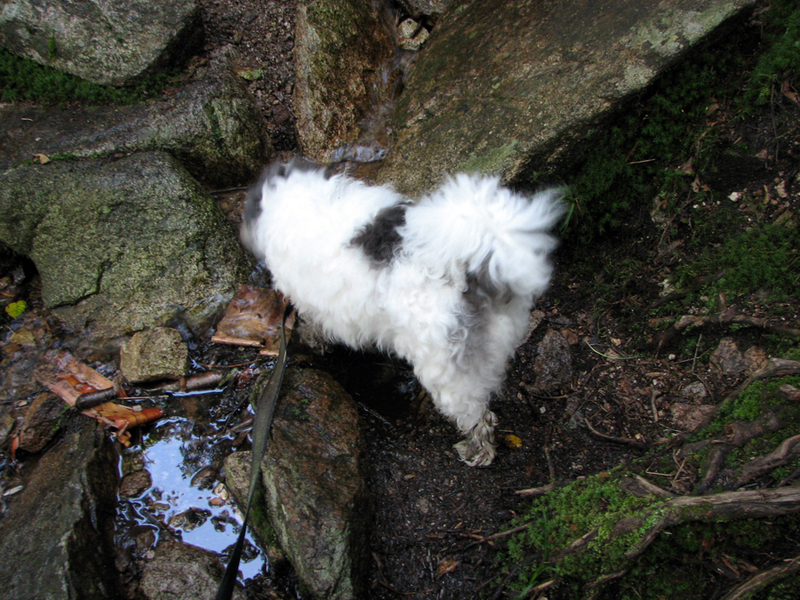 Patches gettting a drink from the spring. Patches on Mt Starr King. She was quickly getting muddy feet and legs on this trip and would need a good bath when we got home. 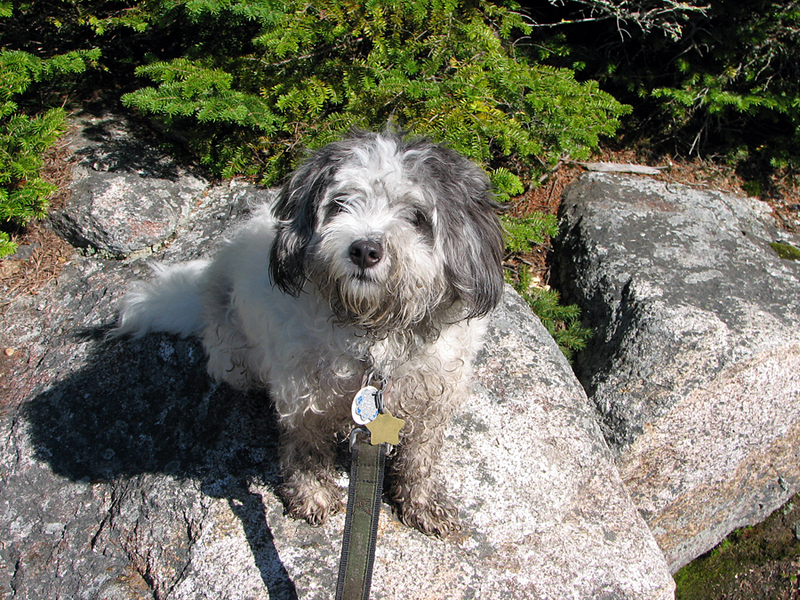 Another shot of Patches on some rocks on the summit of Mt Starr King. 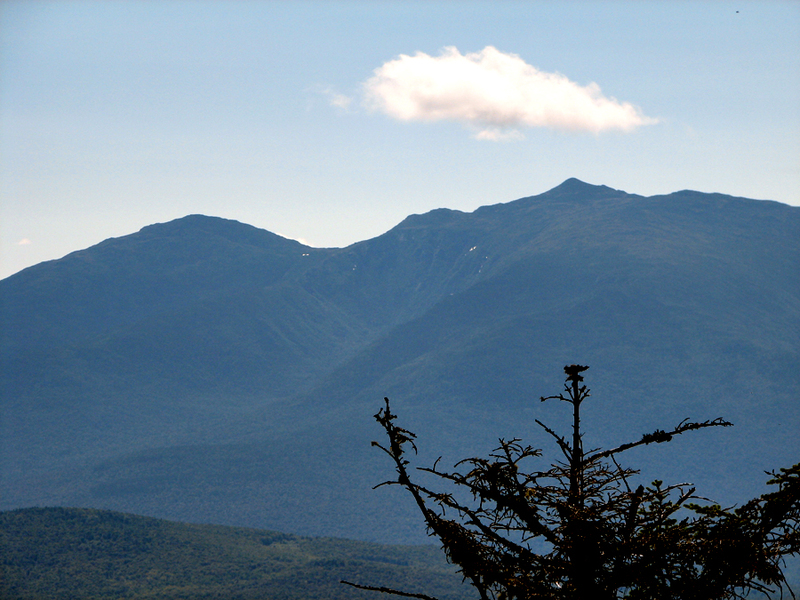 The Presidentials from Mt Starr King. 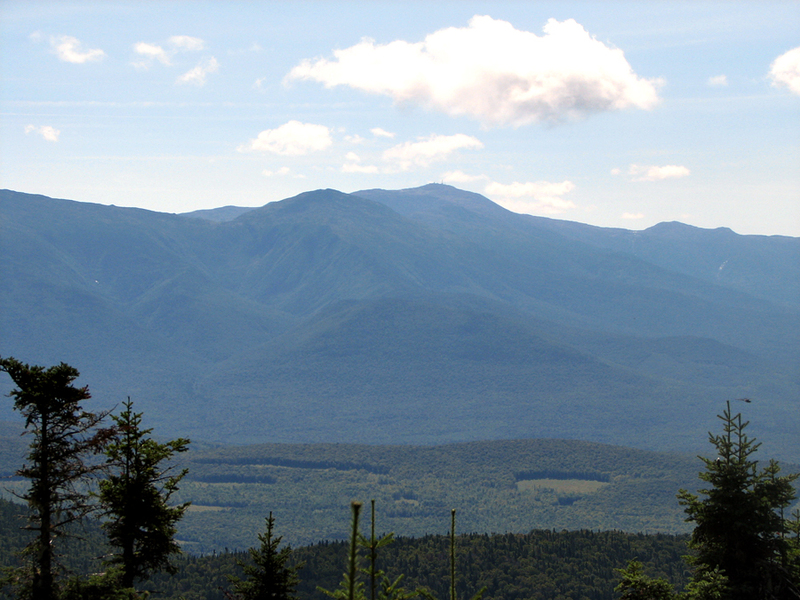 The tallest peak in the center is Mt Washington, while Mt Jefferson is barely noticable directly in front of it. To their right are Mts Monroe and Eisenhower. 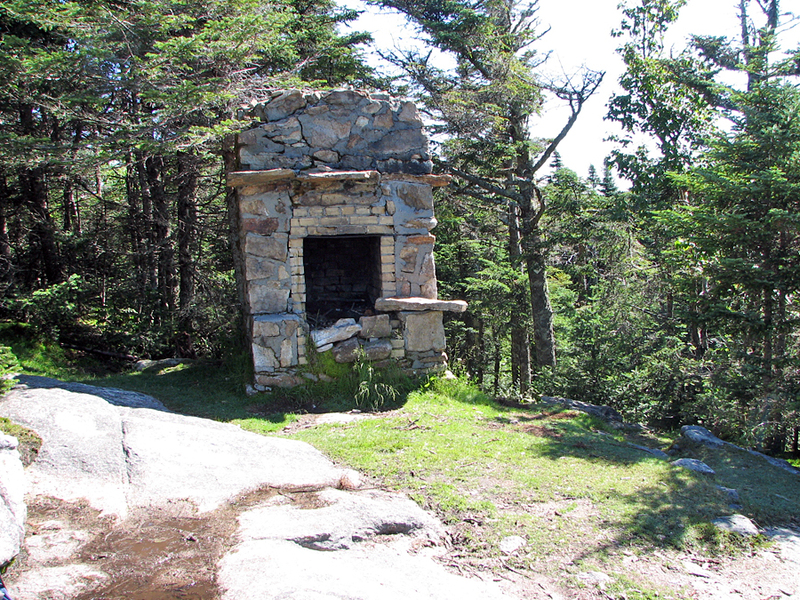 The old fireplace on Mt Starr King. This is all that remains of a shelter that used to stand there. 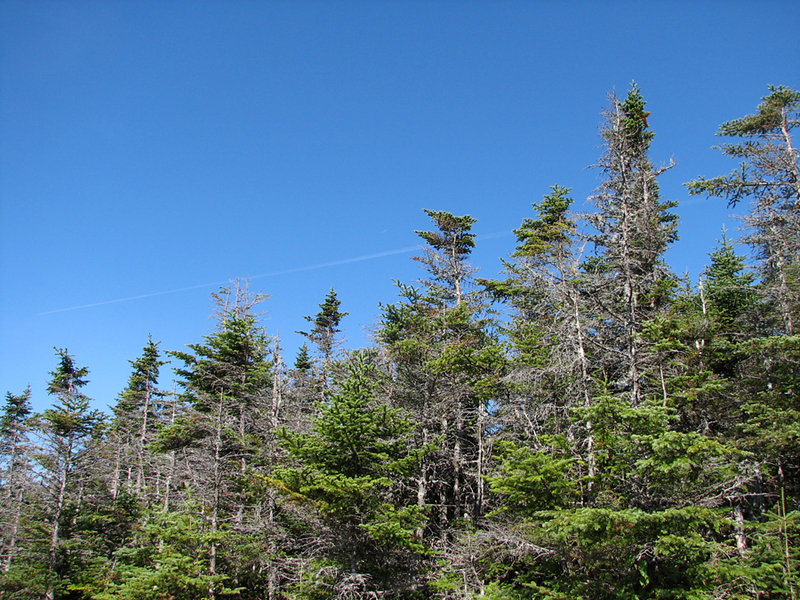 Tall spruce and fir trees on top of Mt Starr King form a sharp contrast with the deep blue sky. 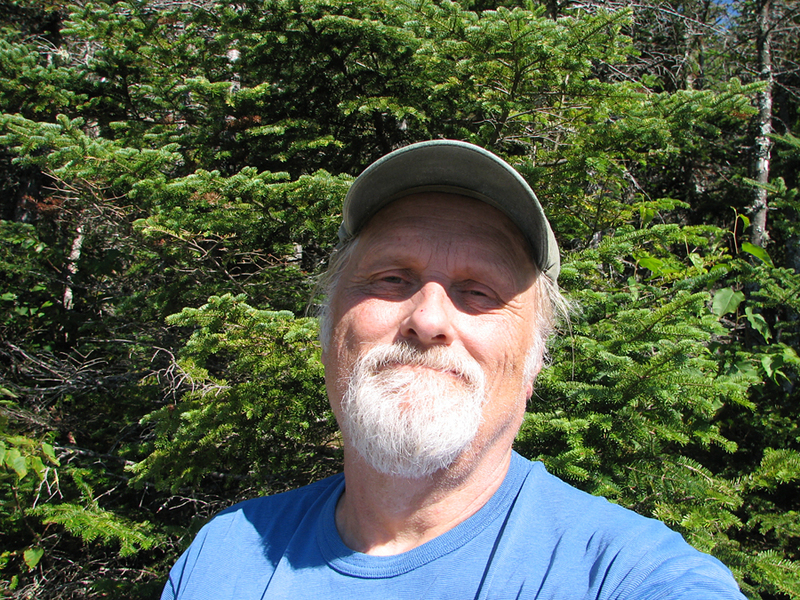 Self-portrait on Mt Starr King. We sat and rested on a rock up there for a while, enoying the weather and the surroundings. Closeup of the Mt Madison, King Ravine, and Mt Adams (from left to right) from a viewpoint on Mt Waumbek. I think that the tiny white spot in the col just below Mt Madison is Madison Springs Hut. 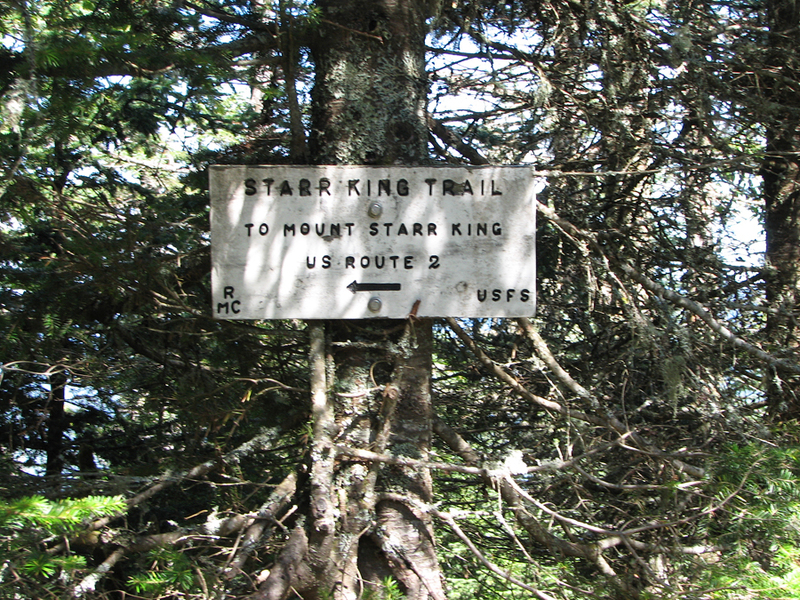 Starr King Trail sign at the top of Mt Waumbek. This, and a cairn on the other side of the trail, are all that marks the summit. 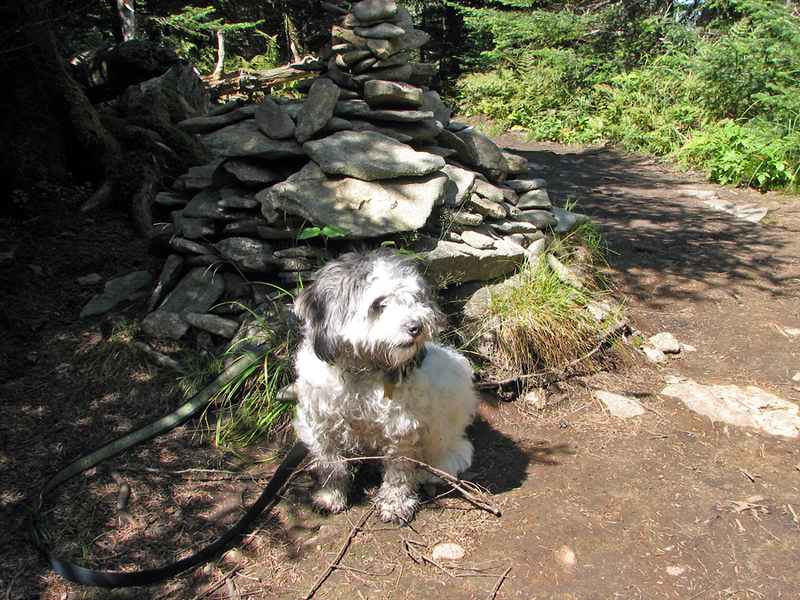 Patches in front of the summit cairn on Mt Waumbek. She hated to sit still for pictures. I think I took four or five to get one even this good. Closeup of Mts Washington and Jefferson from the viewpoint just below Mt Waumbek. I don't know what the treeless patches are in the foreground. Patches near the viewpoint on Mt Waumbek. It was amazing that I got her to look directly at the camera. 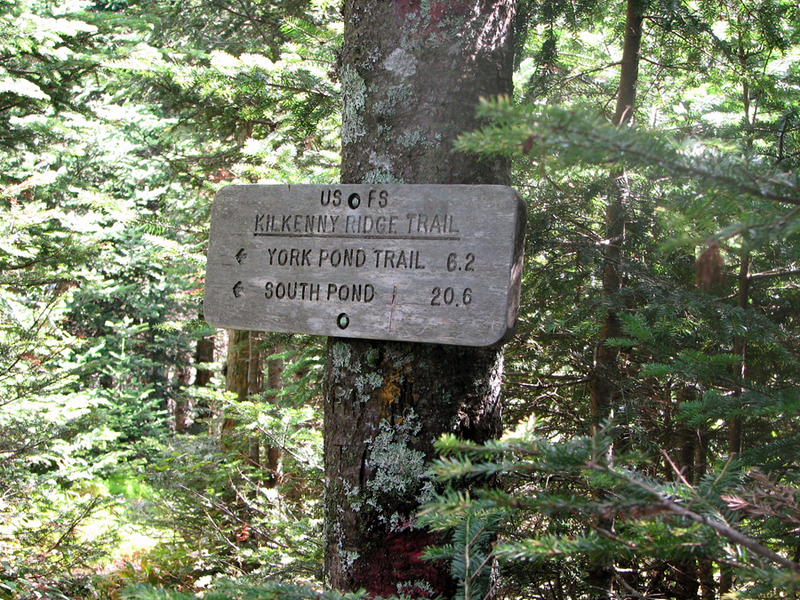 Trail sign marking the beginning of the long Kilkenny Ridge Trail to the north. South Pond is quite a distance away.